Vaclav Holek (1886-1954) is said to be the most important weapons designer in pre- World War I Czechoslovakia. He was born in South Bohemia and apprenticed at the Jan Chmelik rifle works in Písek between 1901 and 1904 while studying at the School of the Technological Industrial Museum in Vienna, from which he graduated in 1905. In 1910 he moved to Prague where he worked for the Jan Nowotny company as an independent gunsmith. Holek pioneered the machine production of hunting rifles. Immediately after the war, in 1918, Holek transferred to the newly established Zbrojovka Praga company, which apparently was a subsidiary of the Jan Nowotny company. 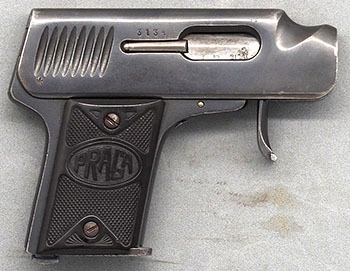 Holek proposed and designed the Praga Model 1919 pistol in 7.65 mm, intended for use by the new Czech army and police, and the Praga Model 1921 pistol in 6.35 mm, intended for commercial sales. In 1924 he designed his first machine gun, the Model 24. 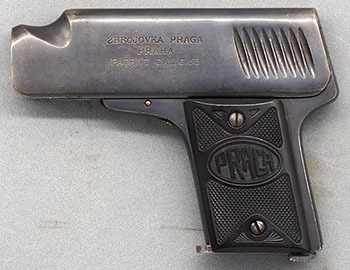 The Zbrojovka Praga company went out of business in 1926, and Holek transferred to the Czechoslovak Zbrojovka (CZ) company in Brno where he improved his machine gun design, which was manufactured as the Model 26, and went through further redesigns as the Model 27, 30, and 33/34. Eventually the machine gun design was licensed to the British in 1935 where it was manufactured as the Brno-Enfield or BREN. As head of the experimental workshop at CZ, Holek continued his work on machine gun design with his brother Frantisek through and after World War II. He authored more than 75 patents, but virtually all were assigned to the company he worked for and so are hard to identify as his. He retired in 1952 but continued as technical adviser to CZ until his death in 1954. 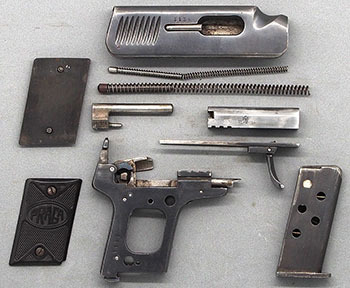 The Model 1921 pistol was only manufactured through February of 1922, though assembly from parts may have continued as late as 1925. Most will be found with the 1921 proof, though a few late pistols were proofed in 1922. In December of 1923 Zbrojovka Praga still had 4760 Model 21 pistols in their inventory, so obviously sales were not good. Post-war Europe did not have a robust economy and most European gun makers were relying on export sales or non-weapons manufacturing to get by. Many sources quote the figure 7400 for total production of the Model 21, though examples are known in the 8600 serial number range, and some examples are also found unproofed and/or un-numbered. R. J. Berger does not believe this many were made, stating, “[t]he serial numbers were probably intermingled with those of the .32 pistol.” He may be right, considering how rarely examples of this gun are seen. The only patent I could locate for the Model 21 is French patent 535,530, which was filed 14 May 1921 and granted 26 January 1922 to the company Zbrojovka Praga of Czechoslovakia. The Model 21 is not like anything made before or since. Its unusual appearance may have contributed to its poor sales, but the design is quite innovative and the quality of manufacture, as with many Czech pistols, is extremely high. The major design innovation is the fold-down trigger which springs into place as soon as the slide is retracted about 3 mm, combined with the finger groove at the front of the slide to allow cocking one-handed. The gun was likely intended to be carried with no cartridge in the chamber, but could be cocked and made ready to fire with either hand. The slide is almost completely hollowed out. A cross-piece at the front rides beneath the barrel. The breech block in the center of the slide is only about 4 mm at its thickest point. The upper portion of the slide is drilled on both sides all the way to just above the front of the ejection port (the entire upper hump of the slide is drilled), forming two hollow tubes above the breech block and chamber. The right tube holds the recoil spring and the left tube holds the firing pin guide rod and the firing pin spring. The firing pin guide rod has a dogleg offset that ends in a block on which the firing pin is mounted. The trigger is mounted on a flat bar of metal with two long tines or rails, one on either side. The rails form the connector bars which connect the trigger with the sear mechanism, and also serve to hold the slide and frame together. The two-pronged connector bar fits into two grooves in the frame as well as a long groove cut into the slide, thus mating the two and preventing the slide from coming off the frame. The trigger bar is held in place by a spring-loaded plunger mounted in the front of the frame. The takedown release lever for the trigger bar is mounted directly under the plunger at the front of the frame. The two rails of the trigger bar act directly on the sear lever, which in turn rotates the sear itself, providing a smooth, even trigger pull of about 7.8 pounds. 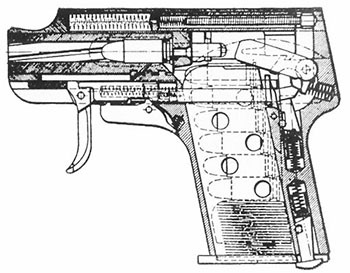 A lever on the left side of the gun, at the rear, serves as both an ejector and a disconnector mechanism. As the slide cycles to the rear, a semi-circular cut in the top of the slide forces this lever down. 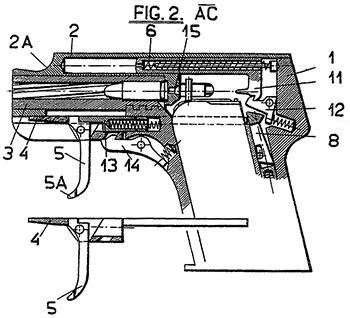 The forward portion of the lever rotates into position at the left rear of the magazine to eject the cartridge, while the lower rear portion depresses the sear lever, disconnecting it from the sear until the slide returns to battery. There is a simple magazine safety. When the magazine is withdrawn, a spring-loaded lever moves forward just enough to block the sear. There is no manual safety. With the trigger folded up the connector bar is effectively locked in position, but the sear remains unlocked. If the gun had a cartridge in the chamber and were dropped, it could potentially ignite the cartridge. Depress the trigger release lever on the bottom of the frame and draw the trigger and trigger bar off the front of the frame. While holding one hand at the rear of the gun to retain the springs, lift up on the front of the slide and pull forward slightly. Note: The easiest way to reassemble the gun is to put the barrel in the slide and put a small piece of tape across the muzzle to hold it in place. Alternatively, the barrel may be inserted into the slide and the two held upside down while the frame is attached. The magazine should be removed and the ejector pressed down for assembly. Berger, R. J. Know Your Czechoslovakian Pistols. Blacksmith Corp, Chino Valley, Arizona: 1989.
International Encyclopedia of Brno, entry for Vaclav Holek. Military Historical Institute of Prague, entry for Praga Model 21.